The world’s largest food companies are failing to meet ethical standards, a report from Oxfam has warned. None of the leading global brands such as Nestlé, Mars and Coca-Cola were given good overall ratings on their commitments to protect farmers, local communities and the environment, while British food giant Associated British Foods (ABF), owner of brands including Kingsmill, Ovaltine and Silverspoon, received the lowest rating.The charity’s Behind the Brands report compiled a scorecard, rating the “big 10” food companies in seven categories: the transparency of their supply chains and operations, how they ensure the rights of workers, how they protect women’s rights, the management of water and land use, their policies to reduce the impacts of climate change and how they ensure the rights of the farmers who grow their ingredients. The company with the lowest score – just 13 out of 70 – was ABF. It scored just one mark out of 10 in its treatment of land, women and climate change, while the highest scores it managed to achieve was three out of 10, in relation to workers and transparency. In joint second-lowest place were Kellogg’s and General Mills, which owns Old El Paso, Häagen-Dazs and Nature Valley, with both scoring 16 out of 70. Oxfam said neither ABF nor Kellogg’s had addressed land rights concerns, or the poverty and lack of opportunity for women working in the supply chain, while the latter company and General Mills showed a lack of transparency in where they sourced their ingredients, only providing information on where they get their palm oil. The company which achieved the highest score was Nestlé, with 38 marks. Oxfam said that while all 10 companies have acknowledged the need for a more just food system and have made commitments to that end, they are still failing to take adequate steps. The charity said ABF’s lack of transparency in its supply chain operations was a major factor in its poor overall performance as few of its brands were able to demonstrate how they do business with suppliers or enforce ethical standards. While some ABF brands, such as Twinings tea, were noted to have good policies in some areas, these were not widespread, the charity claimed. 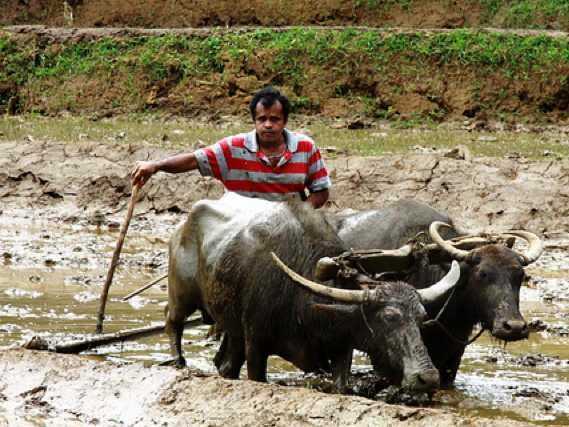 ABF’s Patak and Amoy have no public policies requiring suppliers to pay a living wage or support smallholder farmers and they fail to require their suppliers to prevent pollution or safeguard water quality, Oxfam said. Oxfam said none of the companies had adequate policies to protect local communities from land- and water-grabs despite all of them sourcing commodities plagued by land rights violations, such as palm oil, soy and sugar. It also found that while all of the companies have taken steps to reduce direct greenhouse gas emissions, only five – Mondelez, Danone, Unilever, Coca-Cola and Mars – publicly report on agricultural emissions associated with their products. Oxfam wants the public to use social media to put pressure on the food giants to improve their policies, and on Tuesday launches its Behind the Brands campaign in more than 12 countries including China, Mexico and Brazil. The report was discussed with and made available to the companies covered ahead of its publication.